You are currently browsing the category archive for the ‘FDR pwns everyone infinity no backsies’ category. As readers of this blog know, Franklin Roosevelt declared he had taken the US off the gold standard on March 6, 1933, as the first substantial act of his presidency. But scholars have not been so quick to accept this date or, with firmness, any other. The president’s week had started with his inauguration on March 4, the previous Saturday, when he had told the American people they had only fear itself to fear, and promised them an “adequate but sound currency.” The next day Roosevelt worked all through the day with members of his team and holdovers from Herbert Hoover’s to draft orders to close the banks and halt all payouts of gold. They worked so hard that Sunday that it was late by the time the order was ready for presidential signature – so late that Federal Reserve counsel Walter Wyatt urged the president to wait a little longer to sign, so that it would be Monday, and not so sacrilegious. Roosevelt did wait, and then, on signing the order said – gleefully, according to one account – “We are now off the gold standard.” That was in the wee hours of March 6; later that morning, Americans began a week of doing business without access to banks. At Roosevelt’s first press conference, on Wednesday March 8, he told reporters that “what you are coming to now is really a managed currency.… It may expand one week and it may contract another week.” The end of the dollar’s convertibility to gold was not temporary but “part of the permanent system so we don’t run into this thing again” – which was what he repeated when he said, on Friday, that he was keeping his finger on gold. In other words, before Roosevelt had been in office a full year, he had articulated, with Keynes’s approval, all the elements of what would become the Bretton Woods monetary policy in 1944: currencies would be kept at stable exchange rates, but would be adjustable in keeping with the needs of economic prosperity in each country. 1Historians have a real problem recognizing this, owing I think to the influence of a couple of misleading memoirs by disaffected Roosevelt advisors who didn’t like his monetary policy, and who departed the administration early and therefore got their licks in early. Maybe I’ll write a post about this particular thing. While we’re watching the signal, if not single, liberal achievement — the BFD, if you will — of the Most Disappointing President Ever™ writhe before conservative jurists like a tasty Christian before so many lions deciding whether merely to rip out the mandate or devour it whole (the Scalia lion is, of course, played by Jeremy Irons and drawling, “I can’t believe I ate the whole thing!”), let’s pause to remember how the Real Democratic Party™ acted when the High Court tossed out a law that was important to their constituents and agenda: They simply passed it again, with a different rationale. You can read the whole thing if you like. There’s also this oldie, which at a glance I still stand by. Shasta Dam under construction, photographed in color by the FSA/OWI. The New Deal documented its accomplishments beautifully. And now the Library of Congress has them in an outstanding Flickr collection. The New Deal also beautifully documented the American people; here’s a photograph of African American workers at a Florida “juke joint”. We are still living in the aftermath of World War II. Alexander Field, Greg Clark, and Optimism about the Current Unpleasantness. As we sit mired in the Great Recession, Alexander Field’s exciting reappraisal of the Great Depression offers surprising solace. By showing the Great Depression was coupled with the most rapid technological advance in U.S. history, he fundamentally recasts the history of the 1930s. But he also offers hope that our own depression likely will have no long-run costs to the U.S. economy. By measuring total factor productivity (TFP), or the improvement in productivity not accounted for by traditional inputs, Field finds tremendous gains during the Depression. They owe in part to private investment in manufacturing efficiencies, chemical processes, and other technical improvements. Historiographically, there’s a major payoff in showing that the vast majority of such innovation came during the Depression, not during the war. But (as the bulk of Field’s book is devoted to showing) the productivity improvement owes mostly to construction transportation infrastructure – to the construction of roads, bridges, and all that made the modern trucking industry possible. Field even goes so far as to say the end of the golden age of productivity in the American economy in 1973 “coincides with [he does not quite say owes to] a tapering off of gains from a one-time reconfiguration of the surface freight system in the United States”. Which makes Field sound a lot less optimistic than Greg. The Great Depression turned out relatively well in the long run because we had not only significant private investment in R&D and other improvements, but also the New Deal – road-building and regulation. Do we have that, or anything like it, now? Bretton Woods: not the gold standard. Forty years ago today, U.S. President Richard Nixon closed the gold window and ushered in, for the first time in human history, a global system of unconstrained paper money under full control of the state. It is not that prior to August 15, 1971, there was a gold standard. Far from it. Most countries had severed any direct link between their currencies and gold many years earlier. Right. So the shift to a paper money system didn’t begin with Nixon. And the monetary thing that existed before Nixon’s intervention – the monetary thing that was not, per Schlichter, a gold standard – the monetary thing that happened to go along with decades of global growth and prosperity, the monetary thing that goes wholly unmentioned in the op-ed, was the Bretton Woods system. Franklin Roosevelt’s worst decision was Executive Order 9066, “Authorizing the Secretary of War to Prescribe Military Areas”, which is to say, interning Americans of Japanese descent. The decision for internment had nothing to do with intelligence (particularly, as often alleged, from MAGIC cables) and everything to do with the conviction that “a Jap is a Jap,” as General John DeWitt said. I’ve never been very happy with historical explanations that start and end with “it’s racism,” but really … it’s racism. You can tell of course because there’s no similar simultaneous effort against Americans of German descent. You can tell because of Japoteurs and “Slap the Dirty Little Jap” and lots of other examples. For my family, the war was the European war. My grandfather, a German-born American, had no trouble the way Japanese Americans did; he flew a bomber for the US in the war. We had the luxury of remembering the war the way white people often do – without considering how much better we’ve had it because of our whiteness. It’s profoundly difficult to integrate the psychology of the Pacific War and the European War for the US, either when considering them from the standpoint of history or of memory. Kevin Kruse brings the historicizing to Mitt Romney’s effort to unite us, under God. The concept of “one nation under God” has a noble lineage, originating in Abraham Lincoln’s hope at Gettysburg that “this nation, under God, shall not perish from the earth.” After Lincoln, however, the phrase disappeared from political discourse for decades. But it re-emerged in the mid-20th century, under a much different guise: corporate leaders and conservative clergymen deployed it to discredit Franklin D. Roosevelt’s New Deal. Some notes on comparing Lincoln and FDR. Partly for fun, partly to make a point, I’m writing this post without referring to any texts, either online or on paper. Which should explain, if not excuse, any paraphrases or errors. The point may or may not become clear by the end of the post. This is not going to be an “FDR is better than Lincoln” post; you have been warned. Why do we always refer to the GI “Bill”? Lincoln gave his life that the Union might be preserved; he died before he knew that, from the wreck of war, a stronger and more enduring Union would arise. Franklin Roosevelt gave his life that a greater Union—a Union of all peace-loving peoples to achieve peace and guard the hard-won heritage of freedom—might rise from the desolation of a more terrible war than Lincoln ever imagined. He, too, died before he saw the fulfillment of his vision. To us who remain behind, he left the heritage and the responsibility of that vision, that bright hope from which his purpose never turned aside. How a bill becomes a useful law. Congressman Brent Spence of Kentucky on how to negotiate when approached with amendments to the Bretton Woods bill in 1945. I wouldn’t agree to anything…. You see, if we accept something now it puts us just in the same position as if we hadn’t accepted it…. Every amendment we accept kind of weakens us. [W]e might say, ‘Well, we’ll accept them if that’s all the amendments.’ But if we are going to have to fight it out, we just as well fight it out on all of them. Could someone explain this to the people in the White House, please? As a recent post on Metafilter points out, the well-known children’s author and sometime New Yorker cartoonist Syd Hoff had a radical alter ego, a Mr. Redfield who drew cartoons for the Daily Worker. Philip Nel has written about Hoff’s radicalism here and here; apparently, despite being a real-live Stalinist through and through—i.e., ticked at those who bailed on the party after the Hitler-Stalin pact—and a high-profile children’s author, Hoff never got blacklisted. And his cartoons collected in The Ruling Clawss have a certain topical bite as critiques of what we’re now to call the one percent. I came across Hoff in my own research because he illustrated a pamphlet supporting Bretton Woods titled Bretton Woods is No Mystery published by Pamphlet Press in 1945. The pamphlet’s author, Joseph Gaer, was a UC Berkeley lecturer who wrote extensively about religion, labor, and Western authors (including Bret Harte and Ambrose Bierce). At the time he wrote the pamphlet, Gaer was director of the CIO PAC; shortly before that he had been an assistant secretary of the Treasury and before that worked for the Farm Security Administration and the Federal Writers’ Project. He was also founder of Pamphlet Press, which (the back cover explains) worked “to find the area of agreement among all the progressive groups of our nation and unite them on the issues of their common concern”. At the time of the pamphlet’s publication, the Treasury had embarked on a campaign to persuade Americans across the political spectrum to support the Bretton Woods Agreements and their adoption by Congress. Opposition came from the American Bankers Association and Senator Robert Taft (depicted by Hoff below). So a Democratic administration put forward an international banking bill, and met well-funded opposition from the main banking trade group, opposition that persuaded the New York Times, the Wall Street Journal, Newsweek, and much of the major metropolitan newspapers that the bill was a bad idea. Nowadays, a Democratic administration in such a position might well just give up. 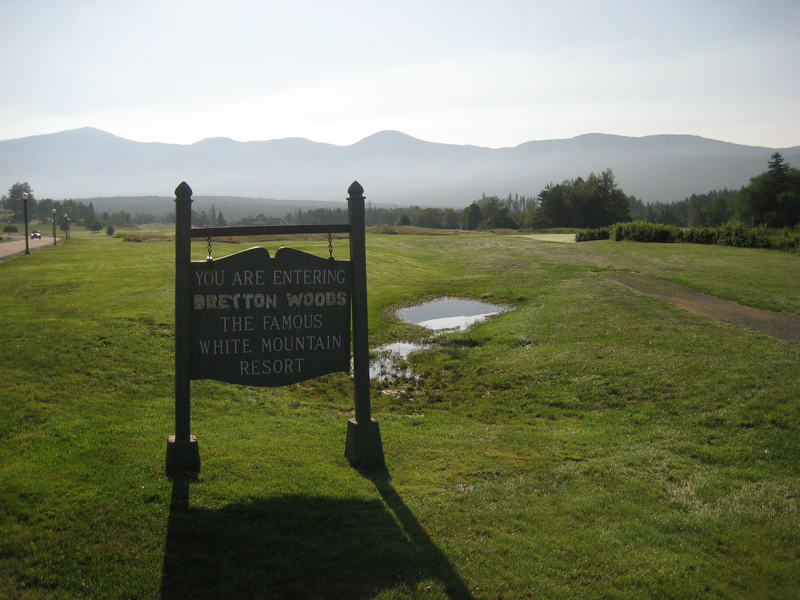 But the Roosevelt administration did not: it mobilized regional bankers, civic organizations, and labor groups on behalf of the bill, persuading them that it was vitally important to support Bretton Woods because (a) it was the first opportunity for Americans to show that in 1945, unlike in 1918, they would embrace international responsibilities and (b) it was a program for world prosperity and full employment. That it hasn’t worked that way lately is more a reflection on what happened to Bretton Woods since 1971 than how and why it was created; at the time the Roosevelt administration meant it to save international capitalism, and lined up a coalition of bankers, businessmen, civic-minded middle-class professionals, and unions behind the idea that international capitalism should be saved. Keynes’s conference and Morgenthau’s dream. Both the American and British chief delegates to the Bretton Woods conference were tall bald men, but there the similarity between them came to an end, and even in respect of their height they stood differently. Henry Morgenthau, Jr., hung on his own frame like a picture crookedly strung on a hook, while John Maynard Keynes wore his stature as comfortably as his tailored suits. Although Keynes was the older man, his powerful new ideas made Morgenthau look ever more like a relic. As Secretary of the Treasury since 1934, Morgenthau had helped engineer the New Deal. But as Keynesianism swept the policymaking landscape, Morgenthau became more old-fashioned, insisting that whatever Keynes might claim about deficit spending, the government ought to try a balanced budget—though between the Depression and the Second World War Morgenthau never presided over one. A cruelly witty Cambridge first who indulged his refined tastes in champagne, men, and women, Keynes enjoyed the comforts of the English upper class. Morgenthau was a relative outsider in America: a Jew who attended a state university but failed to graduate and instead became a farmer. It was only because he really took his farm seriously that he enjoyed a rapport with his Dutchess County neighbor, Franklin Roosevelt. War on terror floating exchange rates. So as I read this, a Bretton-Woods–style system of stable exchange rates would be a potent weapon in the war on terror. You identify the countries harboring problematic insurgencies, set your adjustable peg high enough that insurrections can’t operate effectively, and watch the rebellion wither! Is there any problem FDR’s policies can’t help us solve? Peace was seen as linked with world prosperity, and prosperity, with free trade, free capital movements, and stable exchange rates. 1Raymond F. Mikesell, “The Bretton Wood Debates: A Memoir,” Essays in International Finance no. 192 (March 1994), International Finance Section, Department of Economics, Princeton University, 4. You can watch Orson Welles give an account of the War of the Worlds hoax on YouTube here. Of course this is from F is for Fake, so treat it accordingly. FDR never met with the aliens. If he had, he would have driven them from New Jersey by the sheer force of his awesomeness. UPDATED to add, hear the original here. FDR, still our greatest president. Adam Serwer on how the New Deal is holding Sharia at bay. You want a new deal? How about half-price wings? Speaking of US-Central American relations as we were, one of our far-flung correspondents sends us the below, from Guatemala. I mean, who needs to be on Mount Rushmore when you can pitch buffalo wings with a side of sexism.